Scenic beauty, mountain vistas, waterfalls, streams, and the whisper of evergreens blowing gently in the wind make for a magical mountain experience in North Carolina. Explore the forests, waters, and mountain towns of the Appalachian, Blue Ridge, and Great Smoky ranges. Walk the mile-high swinging bridge at Grandfather Mountain, look for the mysterious Brown Mountain lights, watch a Native American historical drama outdoors, check out the galleries in Asheville - "The San Francisco of the South", visit the nation's largest private home - the Biltmore Estate, and peruse regional arts and crafts while following the WNC Quilt Trails, and you'll fall in love with North Carolina's mountains. Place your cursor over the highlighted tab at top of this page for a drop down menu of NC mountain area cities featured on this site. 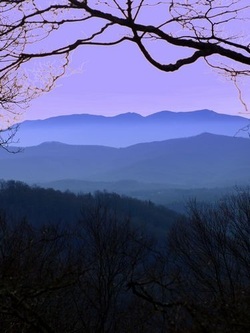 The Blue Ridge Parkway - 75 Years and Still Going Strong!